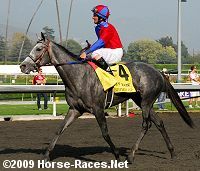 A field of 12 two-year-old fillies went to post in the $2 million Grey Goose Breeders' Cup Juvenile Fillies (G1). Blind Luck, winner of the Oak Leaf after finishing second in the Del Mar Debutante, was sent off as the 7-2 favorite in this 1 1/16 mile main track event. Also in the field were 9-2 second choice Connie and Michael, winner of her debut by 7 3/4 lengths last out and making just her second lifetime start in the Breeders' Cup, and 5-1 third choice Negligee, winner of the Alcibiades at Keeneland after finishing second in the Ontario Debutante at Woodbine. 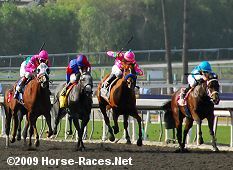 Jockey Garrett Gomez sent 6-1 Always a Princess to the front early and she set fractions of 23.88, 47.52, and 1:11.61 with Connie and Michael stalking her in second the whole way. Entering the stretch, Always a Princess continued to lead with Blind Luck moving up to challenge. However. 7-1 She Be Wild, who stalked the pace in third the whole way, came through on the inside to take the lead and was all-out to hold off the late-running 9-1 Beautician late to get the win by 3/4 length in 1:43.80. It was just a head back to favorite Blind Luck third. 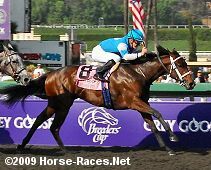 This was the first of three Breeders' Cup wins for jockey Julien Leparoux, who won the Bill Shoemaker Award as the Outstanding Jockey of the 2009 Breeders' Cup. 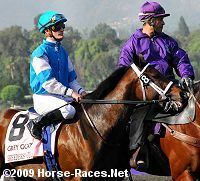 He was the only jockey to win more than one Breeders' Cup race. 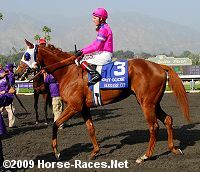 His other wins were aboard Informed Decision in the Filly and Mare Sprint and Furthest Land in the Dirt Mile, also he was third with Forever Together in the Filly and Mare Turf. She Be Wild wins the Juvenile Fillies. Left: She Be Wild gets her head cooled down while parading with her flowers. 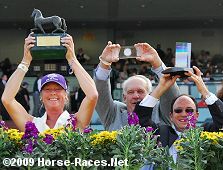 Right: The trophy presentation with owner-breeder Nancy Mazzoni on the left and trainer Wayne Catalano on the right. Catalano said, "When they were loading, she was getting a little excited but she broke good. Everything went well. I'm really happy with her. I was a little worried when it looked like she might get trapped but I have a good rider who is patient. I felt good when she poked her head in the hole. She's not a big filly so it doesn't take much room." 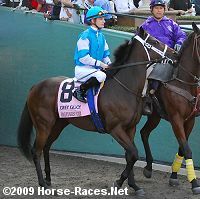 Left: She Be Wild heads out to the track before the race. Right: She Be Wild in the post parade. Her jockey Julien Leparoux said, "I got a perfect race. I was on the rail all the way. I was hoping it would open up at the top, but I didn't really know. It did open up, a little bit, and that was good. That was all I needed." Left: Second place finisher Beautician returns after the race. Her jockey Robby Albarado said, "I had a bounced-around trip into the first turn. I was shuffled back further than I wanted to be, but she ran really well. At the top of the lane I thought I was in good shape, but (winning jockey) Julien was on the fence and got there. It would have been nice to have won two in a row." Her trainer Ken McPeek added, "Beautician ran her race � I have no complaints." Right: Third place finisher and beaten favorite Blind Luck goes to get unsaddled after the race. Her jockey Tyler Baze said, "She got bumped pretty hard on the first turn. She got jostled around pretty good at that point. She tried real hard, like she always does. I put her in place to win but she just got outrun." 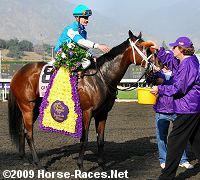 Her trainer Jerry Hollendorfer added, "We got beat. No excuses. Coming for home, I thought we had enough horse to win." 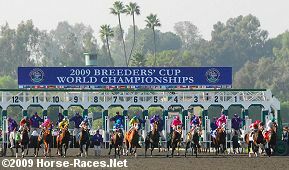 The horses break from the gate for the Breeders' Cup Juvenile Fillies.